We were originally contacted by the Leicester Grammar School back in January as they were searching for a supplier to supply event décor for their school prom. They had a very clear idea of exactly what they wanted and how they wanted the room laid out which made the planning process for this event an absolute breeze. Our team had just 2 hours to set up for the event on Saturday, we started by laying our white LED dance floor in front of the stage where our black LED backdrop would stand. 8 metres of red carpet was used with gold posts and velvet ropes to create a VIP entrance for the room to ensure all guests arrived in style. 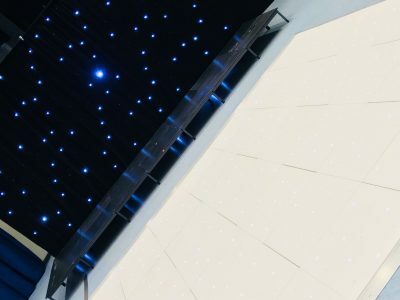 The prom was also the debut event for our new foldable chrome poseur tables, these were placed in the corner of the room near 4 of our uplighters which were washing the walls in mesmerising colour. 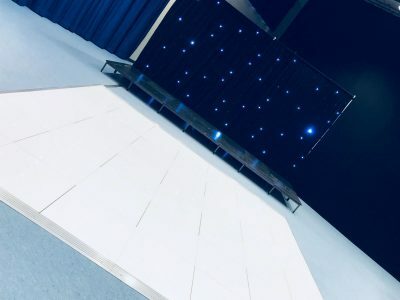 In summary the school prom was a massive success and we received some fantastic feedback from Erica, the event’s organiser and our white LED dance floor attracted a lot of attention in particular with guests commenting that they’d never seen the students “dancing that much”. Are you planning a school prom? If you’re planning your school prom or party please don’t hesitate to get in touch for your free online quotation. 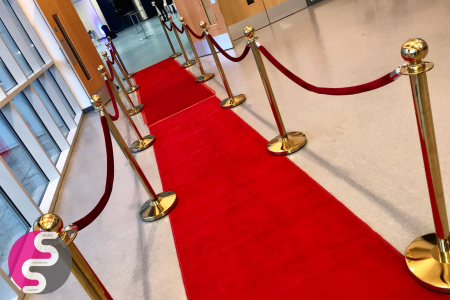 Our experienced team have supplied event decoration for parties of all sizes in Leicester and UK including; Coventry, Derby, Northampton, Nottingham, Birmingham & London. You can give us a call on 0116 2885956 or alternatively you can email us on info@solidstateuk.co.uk. I just want to say a huge thank you to you all for a fab night last night. Everybody has a fantastic time and it was great to see them engaging with everything on offer around the room. About to start an event like Leicester Grammar School Prom? If you are thinking about a similar event and need to discuss your requirements why not contact us? We would be more than happy to hear from you.